We hope that you all had a great Christmas break and like us, can’t believe that is March already. Here is our second instalment to keep you up-to-date on all things NMI. It is with great pleasure that we are proud to announce that NMI is moving into a new factory premises. 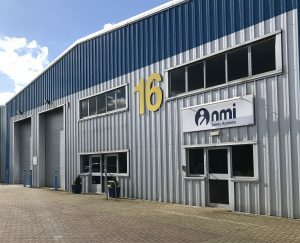 This will see us relocate from Tottenham, which has been our home for the last 25 years, to take up new residence in Stevenage, Hertfordshire just north of London with fantastic access from the A1M. The new site is nearly three times the size of the existing operation and will pave the way for continued plant investment and job creation. This relocation has been in the works for a long time as we wanted to make sure that our new home will be fully equipped to sustain NMI going forward. The 18th April will mark the next chapter of NMI’s journey, and will look forward to inviting customers and suppliers alike to our new Showroom. ‘This signals a substantive evolution in what we do and how we do it. The new facility is designed to increase our capacity, transform our processes whilst allowing us to continue to innovate and efficiently operate within an ever changing global market. 16 IO Centre, Arlington Business Park, Whittle Way, Stevenage, SG1 2BD. We are very pleased to announce that we are attending both the CV Show in April and the NAPFM event in June. At the CV Show, which is hosted at the NEC in Birmingham, we will be sharing a stand with Treka Bus and exhibiting products such as our Sit Safe, Seatback and Removable RIPS. The NAPFM exhibition which is now in its 44th year will be hosted at the International Centre in Telford. This more intimate event allows leading suppliers, converters and manufacturers to discuss new developments for the emergency services. We will exhibiting on stand number 35, opposite the Fiat/Chrysler and Premier Hazard stands. If you’d like any more information on either of these or any other upcoming events, then please don’t hesitate to contact: sales@nmisafety.com. What we believe sets us apart from most suppliers is that we can offer on site training for both converters and end users. If you currently have one of our products and would like to organise training for your team then please contact Jeremy Fortey on; Jeremy@nmisafety.com.